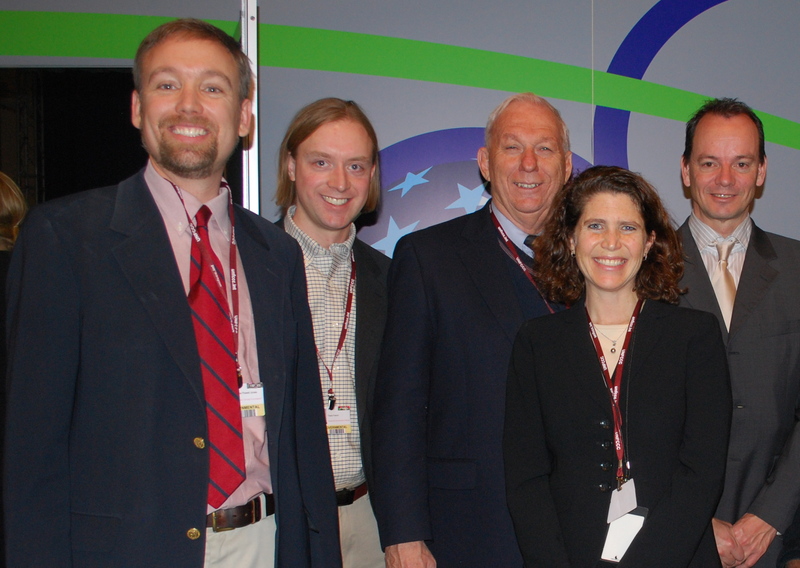 The Climate Interactive team, led by Sustainability Institute, delivered big results in Copenhagen at the UNFCCC’s COP15 climate conference. He is overstating our uniqueness, but here are the top ten most notable moments and achievements. 1. Obama heard (at least they tell us). 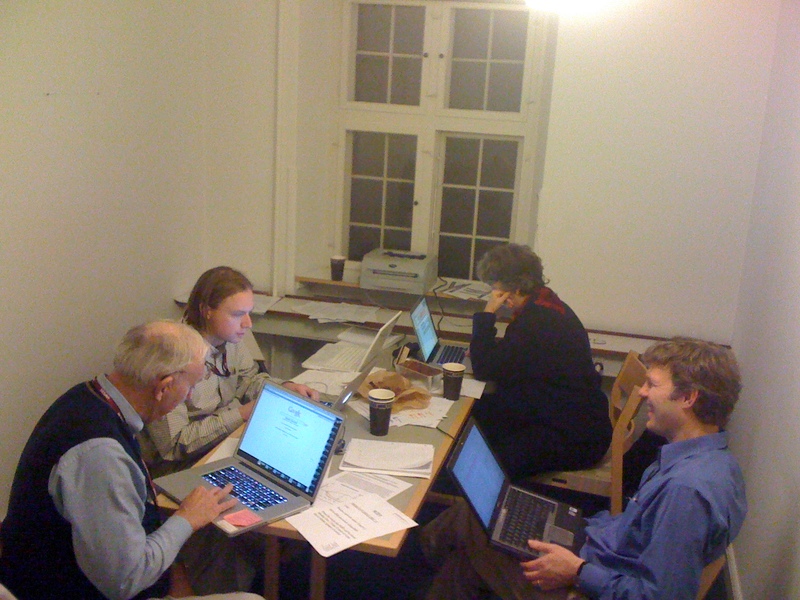 From our office in Copenhagen hosted by the Rasmussen Foundation and Sea Change, 48 hours before President Obama’s arrival, we created two rounds of customized real-time C-ROADS analysis of the COP15 negotiations requested by and delivered to a top White House science advisor who briefed the President before his activities in Copenhagen. 2. Our Climate Scoreboard went viral. While we expected only dozens of blogs and Facebook pages to embed the “widget” we created, we found that over 1500 actually did and that sites around the world, in multiple languages, added the Scoreboard (supported by Morgan Family Foundation) to their online media. CBS, NPR, Boston Globe, YES!, Washington Post, ABC News, and Nature for example. While we expected a couple thousand visits, we witnessed over 300,000 visits to the Scoreboard! 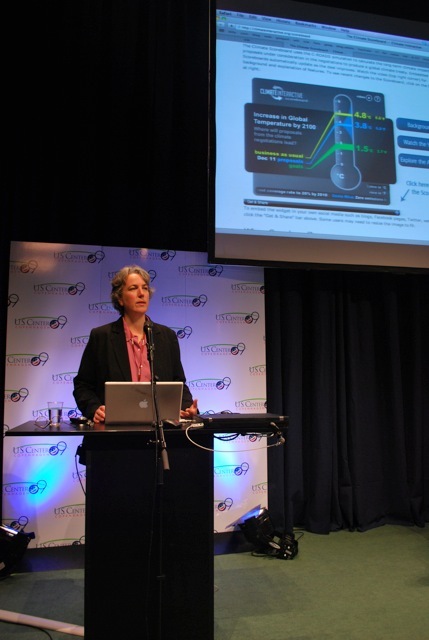 See videos of Beth Sawin presenting it here. 3. Real time analysis of negotiations happened. As draft texts were released, we analyzed their impacts in C-ROADS (supported by Zennstrom Philanthropies) really fast. Press releases during Copenhagen are here. 4. C-ROADS analysis got to the negotiators. A dramatically leaked confidential UN document (reported in a scanned pdf version mid-conference by the UK Guardian) had the words “Climate Interactive” and “Climate Scoreboard” scrawled across the top! Check it out in the document. 5. Open source thrived. 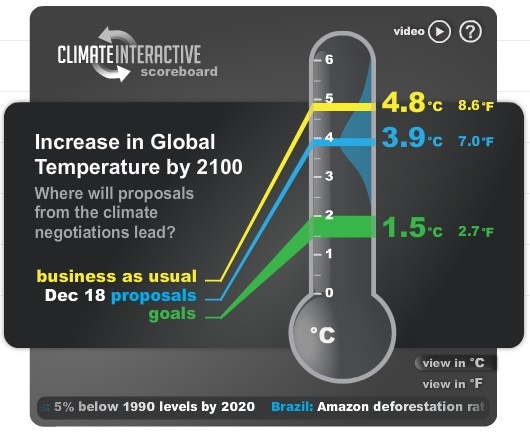 The International Herald Tribune, 350.org, and others used our Climate Scoreboard data to report the final state of the global deal. Our “open architecture” and “open source” approach, as designed by our teams from CitiGroup, SoL, IfPeople, and here at SI worked — we shared our C-ROADS simulation data output online and journalists and graphic designers used it well. 6. We got quoted all over the place. In The Washington Post, Nature, Dot Earth, and Newsweek among others. 7. New delegations are picking up C-ROADS. The United States State Department used C-ROADS “Common Platform” during the Copenhagen meeting. And, supported by the Rockefeller Brothers Fund, we are adapting it for the Chinese Government. But during COP15, five other delegations asked for copies and demonstrations of the simulator (they are not ready to disclose their interest). 8. We are (happily) not alone. As shown in the joint press release from the first week of COP15, we are one of four prominent groups analyzing the state of the global deal. We now share this important role with Grantham Research Institute, Project Catalyst, and Climate Analytics. 9. We connected with Chinese colleagues. We met with Professor He Jiankun and his team in Copenhagen and are looking forward to future collaboration. 10. Our events were packed. At the side event we held at the US Center within the Bella Center — full video is here and US State Department testimonial here — the crowd was standing-room-only and full of questions. Okay, enough patting our own backs. We’re here for climate results, not project results. Join us in 2010 to make them happen!